Happy Friday loves! So one of the best surprises ever was realizing that I was off today. I totally forgot that Veteran's Day fell on a Friday this year so I'm happy to be writing this post at the start of my unexpected 3 day weekend. I am just going to jump right in because I have a ton of items to share with y'all from the Sephora VIB sale. Caudalie Vinosource Serum-This is a refill because I am absolutely in LOVE with this serum. I recently added it into my skincare routine and now can't live without it. St. Tropez Gradual Tan-This is also a refill of my holy grail self-tanner HOWEVER I have never tried the one with the "sculpt and glow" properties. It sounds like the added ingredients are great for dry skin and since I have eczema I can't wait to try it. This is the only self-tanner that doesn't irritate my eczema and actually makes my skin feel even softer! Huda Beauty Shadow Palette-This palette is full of colors that are absolutely gorgeous and I can't wait to try it out. I've been looking for a new palette that would be great for travel and this one looks like perfection. Fenty Beauty Universal Lip Luminizer-I have seen several beauty bloggers rave about this lip gloss and it looks like such a GORGEOUS color on every skintone. Can't wait to try it! Sephora Collection Liquid Lip in "Vintage Rosewood"- I have never tried the Sephora Collection products before but doesn't this look like the perfect fall shade? It's super unique from anything I currently own! Fenty Beauty Contour Stick in "Mocha"- I am really into cream contouring lately and I wanted to give this contour stick a try because I'm almost out of my Benefit "Hoola" cream bronzer. Will definitely let y'all know my thoughts. I love the Hoola one but it's a little light for my taste. Hourglass Bronzer + Powders-I have been using the Hourglass Ambient Lighting powders for years as either a subtle highlight or to set my entire face because they just give a really natural glow! About 2 years ago I picked up the Hourglass bronzer and it has been my holy grail bronzer ever since. That being said I think this palette is a GREAT value and would be awesome as a gift or if you're just looking to have a really solid palette for travel! Dior "Pump 'n Volume" Mascara-As y'all probably know, I am ALWAYS on the hunt for the best mascara out there and this one is my current favorite. I would say that if you aren't a fan of mascara that clumps, you probably won't like this one. It does clump a little bit but it almost makes your lashes look even more thick and voluminous! It's weird but I actually kind of like it. Nars Tinted Moisturizer-This has been my go-to lately instead of foundation. It looks super natural and it's definitely light coverage so if you're looking for something with more coverage you definitely wouldn't like this! I just need something to even out redness in my skin and this definitely does a great job neutralizing my face. I always LOVE how my skin looks when I wear it and it's just dry skin heaven! Becca Highlighters-I love almost ALL of Becca's highlighters. Champagne pop and opal are my absolute favorite and this palette comes with Opal and a new highlight that's almost identical to Champagne Pop. It also has a bronzer which I've been dying to try and a gorgeous blush shade! Definitely a great value. Laura Mercier Lotion-I feel like a lot of people don't know that Laura Mercier makes fragrances and also body butters/lotions. I LOVE the scent of almond and coconut so this lotion is absolutely dreamy. I do prefer the scent more for the spring and summertime but honestly I'll use it year round! 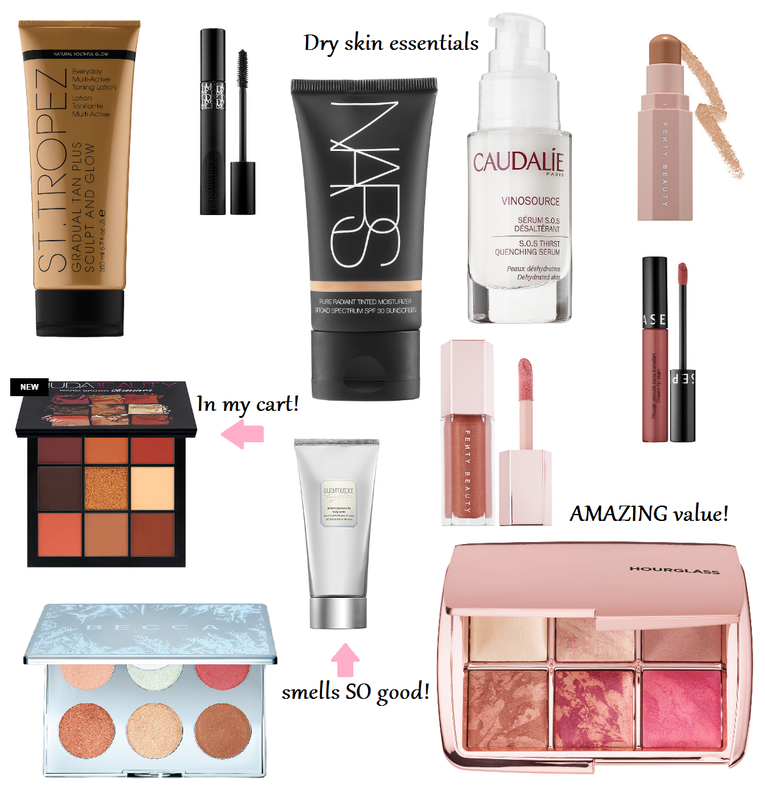 Hope y'all found this post helpful while shopping the Sephora sale! Have a great weekend! Oh wow, these picks are so beautiful and I've heard such great things about nearly all of them. I'd definitely want to try the gorgeous Huda and Hourglass palettes. I mean, look at those colors! You can do so much with them, from neutrals to more dramatic looks. Thanks for sharing, gorgeous, and I hope you have a very Happy Friday! You got some good things! I didn't even realize there was a sale. These things all sound so good. I'll have to check out the sale. Awesome picks dear! That Huda Beauty Shadow Palette-This palette is absolutely beautiful!